Chick takes lunches to school with her every day (apart from Friday because that's chip day!!!). So when Copella asked me if they could send us some of their new wedges I was all for not having to buy drinks for this week's lunch. Now if Chick could choose what she wanted to take to drink it would be either something fizzy or full of E numbers and we generally have the same discussion every week in the supermarket as to why she can't drink that rubbish!!! We received a box of four Apple & Elderflower wedges which retail at around £2.49 and also come in English Apple variety. Each carton is one of your five a day (which Chick doesn't need to know ;-) and have no added colours, sweeteners or flavours. All of the apples in the Copella drinks are freshly pressed and bottled at their farm in Suffolk and have been for the last 40 years. The name of the Company comes from the first letters of Cox's Orange Pippins which are the main type of apple used in the juice and also from the founders daughters name, Carmella.....I think that's pretty cool!!! 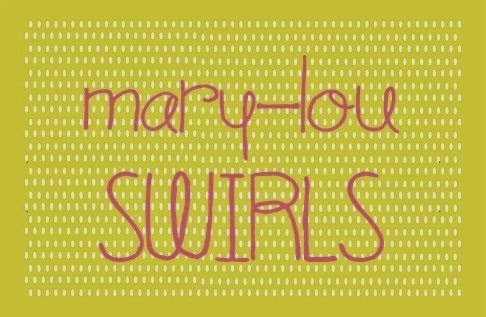 So what did we think? Well, I love the fact that they are convenient and I can just put them into the lunch box with no messing around. I'm also quite a fan of the fact that they are one of our five a day and have no added nastiness. The only downside that I can come up with is that they are quite pricey for four compared to some supermarket own brand juices. Chick is the main juice drinker in the house and she says that she can't taste the elderflower but they make her tongue tingle and she loves them!! Available from all of your typical supermarkets. 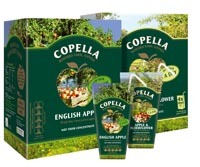 For more information about the juice and the fabulous Boxford Farm please visit the Copella site. 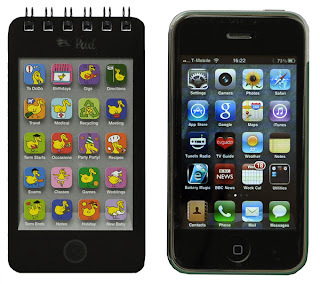 eyePad Review and Dodo Pad 50% off discount code!!! 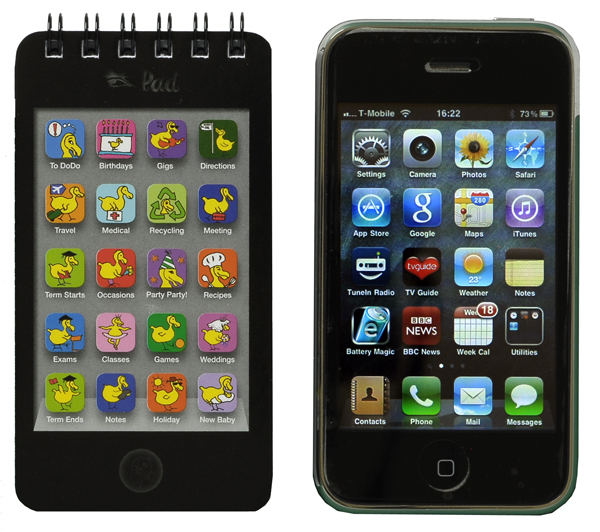 The eyePad is a funky little notepad that is similar to a very popular mobile phone!!! It's a great size to have in your handbag or on the telephone table for note taking. I would love to say that I keep it in my handbag and use it for scribbling stuff down but I managed to keep hold of it for the grand total of 10 seconds before Chick stole it away from me!! She has pretended that it's her mobile, filled most of the pages with doodles and told everyone how great it is! I think I'm going to have to buy in bulk and put them in her party bags in November as it definitely has the cool factor. *A couple of products are excluded from this offer as are sale items. Disclosure - As stated Lord Dodo sent me an eyePad and are also sponsoring me to go to CyberMummy. Chick got this for Christmas and I think that my Cousins may have been more excited than Chick when she first opened it. The boys and Chick played with it for most of Christmas day (in between pints of Guiness as below!! )...over the walls and the floor and mainly getting in everyone's way!!! As you can see from the video we were struggling to make it work but finally got it going properly once we had charged it all up. The only downside to this toy is that the run time is only about 10 or 15 minutes and it takes half an hour to charge up. You can also buy a Mini version which is pretty cool! I think that my daughter may have a career in TV presenting! The lovely people at Clifford James sent me a Halogen Oven to review. It came last week and with the thought of cake baking in my head took it out of the box with great excitement. My excitement was swiftly replaced by terror as I took in the space age item in my hand, which was quickly returned to the box! It has sat in the corner of the kitchen for a week staring at me in disapproval as I use my plain old boring oven. Over the weekend I decided that I needed to man up and just use it! Thankfully it comes with an idiots guide for use which even I understood! The halogen oven is billed as 'a revolution in cooking' using the technology of halogen to perfectly cook almost any meal. 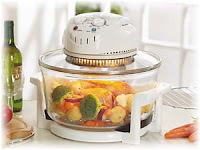 It can be used for baking, defrosting, cooking, roasting and steaming and unlike a microwave will brown food too. The fat from the food can drain away and it also has a built in self-cleaning function which I'm sure no-one will argue over!!! The instruction booklet that comes with it is very useful and gives you guide times for cooking meat, bread and pies. I would've preferred it to come with a cook book as well but this is available for £9.99 extra. So far I've managed to bake cakes in the oven which were ok but not perfect so I obviously need to spend a bit more time on them and maybe rotate them next time. I also made chicken and vegetables which was more successful than the cakes although I'd probably do the veg for less time. The great thing about cooking the meat was that all the fat got caught at the bottom so the meat wasn't sitting in it. I've seen some fabulous halogen oven recipes and once I've used it a little more am thinking of trying Asian Ginger Beef which sounds absolutely gorgeous!!! The only downside to the oven is that it didn't actually come with the stand to put the lid on. You can buy it for £6.99 but it would have been much more useful if it came as part of the package. It was a real pain either trying to hold the lid when sorting out the food or trying to find something heat proof to rest it on. I guess if I would've actually bought the oven then I would have purchased this too and would definitely advise you to do so if you purchase one. 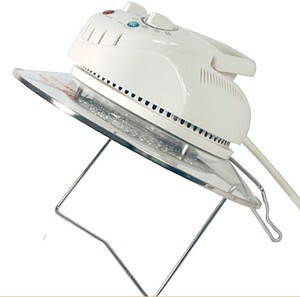 So would I buy a halogen oven? If I had a more spacious kitchen then yes. It's easier than putting on the normal oven and messing around with that but I still think that conventional is easier for bigger meals. For smaller things i.e. pizza, bread and cakes we will probably use this from now on. Also there are suggestions that the halogen ovens use much less electricity than a conventional oven and in these difficult times anything that saves you money must be a good thing!